The world's tallest water slide will be demolished after a 10-year-old boy was killed riding it, park operators have said. 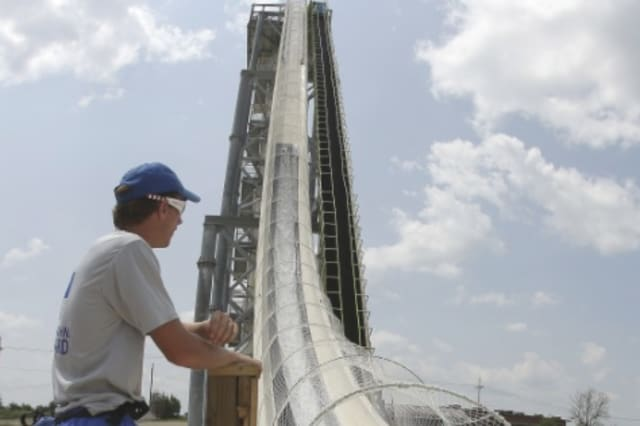 The 51-metre waterslide, at the Schlitterbahn water park in Kansas City, has been closed since the tragedy on August 7 and will close once the investigation into what went wrong is finished. Caleb Thomas Schwab, the son of a US politician, was reportedly decapitated in the horrific accident. The ride, called Verruckt, which is German for "insane", features multi-person rafts that make a 17-storey drop and can hit speeds of 70mph. Riders were required to be at least 4ft 6in tall and were harnessed in with two nylon seatbelt straps while holding ropes inside the raft. Schlitterbahn Waterparks and Resorts said in a statement: "In our 50 years of providing an environment for families and friends to gather, we've never experienced this kind of devastating event. "The safety of our staff and guests is our top priority." Two women in the raft with Caleb were also injured. Regulation of amusement rides has come under scrutiny in the US following the death. Although Kansas mandates annual inspections of rides, it allows private contractors to do the work rather than requiring a state check. No lawsuits have yet been filed. Found at the foot of Mount Etna, this park ranks among the top Sicilian attractions. The aquatic park at Etnaland has a number of high octane slides and activities for families to enjoy including the Rafting River, Rio Anaconda and the Crocodile Rapids. Brazil's Beach Park is situated in the coastal town of Porto das Dunas and has a range of water slides catering for people of all ages and abilities. The park is home to a range of attractions and beautiful views of the coastline are visible from the top of the highest rides. The tourist resort also has accommodation, sports facilities and beach restaurants. Fasouri Watermania is the biggest waterpark in Cyprus and is also home to the largest wave pool in Europe. Popular attractions in the park include the Cross Over Pool, the Triple Tube Slide and the Kamikaze Slide where you can reach speeds of 50km/h. Visitors looking to spend some downtime away from the slides can relax in the Garra Fish Spa or head for a massage in the on-site parlour. Blizzard Beach, at the Walt Disney World Resort in Orlando, is based on the Disney legend where a freak snow fall melts, leaving snow-less ski jumps filled with water. The main attractions are found on top of 'Mount Gushmore' including Summit Plummet, Runoff Rapids, Melt-Away Bay and many more. Discover an underwater world at Aquaventure Waterpark which can be found at one of Dubai's biggest and most popular hotels, Atlantis the Palms. Not only will you get an intense adrenaline rush flying down the extreme slides but you can swim with dolphins and sea lions before going on to explore the Lost Chambers Aquarium. Tropical Islands Resort is housed in a former airship hangar which is thought to be the largest free-standing hall in the world. With white sandy beaches, palm trees and even waterfalls, Tropical World boasts a 200m long beach with balmy waters and even a lagoon. Siam Park has a Siamese theme and was opened by the Princess of Thailand in 2008. The park's hillside location offers guests lovely views of the island's south coast. Popular slides and attractions include the Vulcano, Wave Palace, the Tower of Power and the Mekong Rapids. The Wild Wadi Water Park can be found next to the luxury Burj Al Arab and by the side of the Jumeirah Beach Hotel. Based around the story of Juha, a well known character in Arabian folklore, the park offers rides including Tantrum Alley, Ripetide Flowrider and Flood River. Waterbom Bali, in a garden in the heart of Kuta, boasts world-class slides which wind their way through the stunning tropical parkland. Popular attractions include the Flowrider which gives you the chance to practice surfing on a stationary wave and Double Trouble, a death-defying drop followed by a series of sharp twists and turns. Marmaris is one of the most popular holiday destinations on Turkey's coast and the Aquadream Waterpark only adds to its appeal. The park is situated on top of a hill granting visitors to the tallest slides some fantastic views before as they plunging into the waters below.